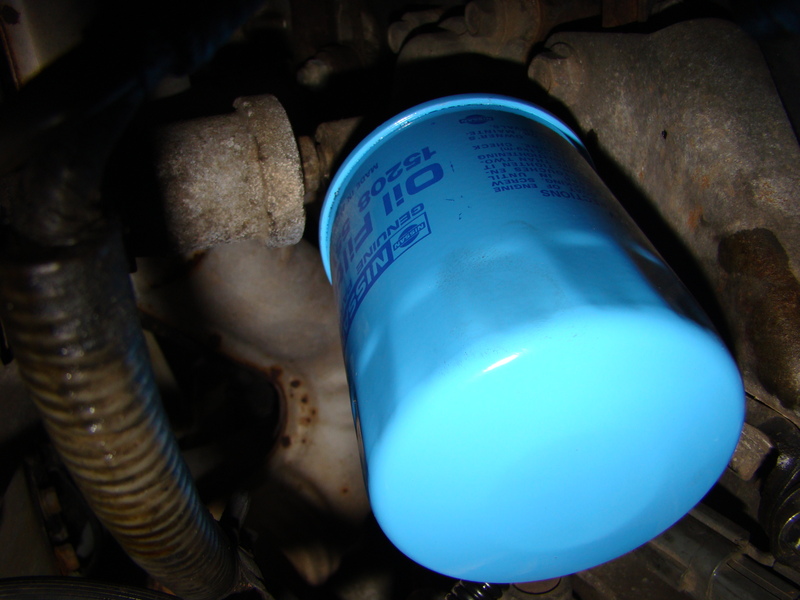 I’m finally starting to take time to document some of the things I’ve been through with the car over the last couple of years so I figured I’d do a quick post about how I solved an annoying vibration problem I was having. I mentioned in an earlier post that after I took the car to a shop to have them replace the clutch that the car was vibrating at all speeds but it was really bad between 35 and 50 MPH. I contacted the repair shop and took the car back to them to have them investigate even though they said it couldn’t be anything they did. That makes sense, the car didn’t vibrate when I dropped it off for the clutch replacement but did horribly when I picked it up… yeah, there is no way it was anything they did. At any rate, I left the car there for a month and they couldn’t find for sure what the problem was I don’t really think they looked too hard and it was like pulling teeth to get updates from them about it. Finally they called and told me that they think it is the right rear tire with a flat spot. Once I got the car home again I switched it back to the OEM wheels and tires but low and behold the vibration was still there. I wasn’t about to take it back to this shop again so the next place I went was a local “fix all” mechanic/tire shop to have them put it on a lift and check it out and they said it was probably a warped wheel so I ordered a replacement wheel on eBay which was another waste of money because it didn’t solve the problem. I ended up just giving up on it for a while and drove the car around with the vibration and mostly got used to it until a few months ago when I’d had enough so I decided to crawl underneath and take another look. 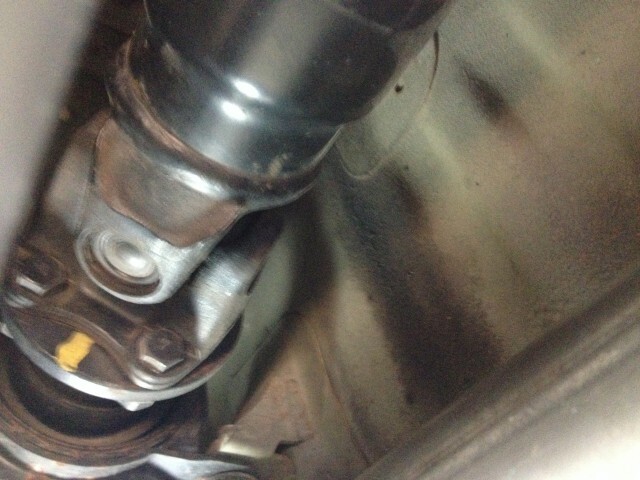 I had read many forum posts about the symptoms I had and a lot of them mentioned the drive-shaft being out of balance. 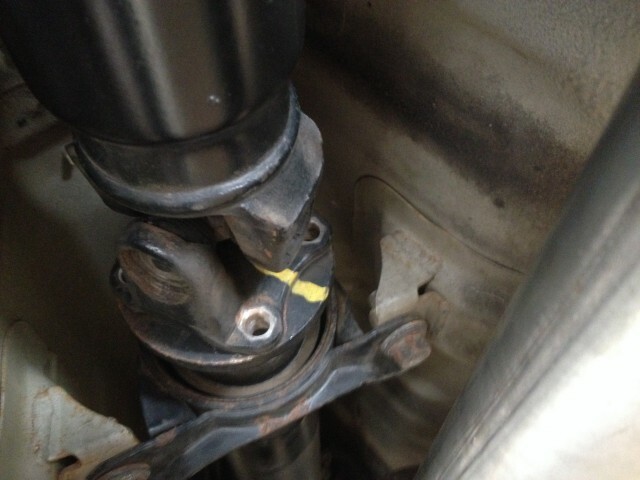 This could be something as simple as a missing washer on one of the 4 bolts that connects the 2 pieces of the drive-shaft. 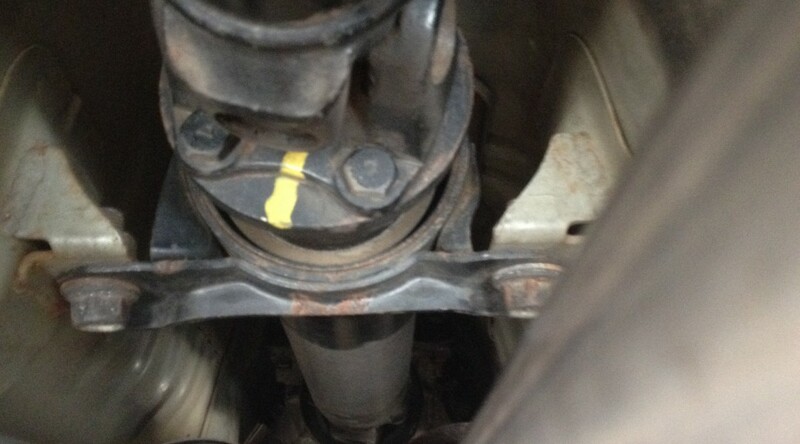 When I was under the car I noticed a yellow mark on the front piece of the drive-shaft (seen in the photo below) that looked like it needed to be lined up with another yellow mark on the rear part of the shaft. 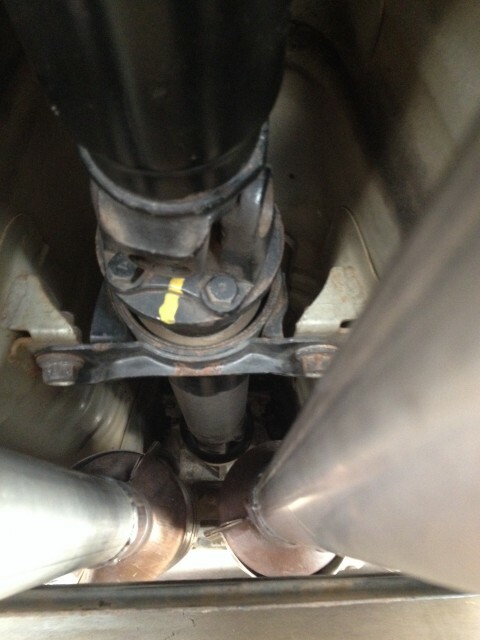 After some fancy maneuvering I was able to get the 4 bolts removed and turn the shaft so that it lined up properly. Once I got everything buckled back up I was eager to get the car out on the road to see if this solved that nagging vibration problem and sure enough it did! I was very pleased with finally resolving this because it had almost made me want to give up on the car a few times. It did make me give up on ever using that shop again. I still cannot figure out how they screwed this up in the first place and then couldn’t find the problem after a month of “investigating” it but I’ll just mark it down as a lesson learned and pass on my opinion of this place to anyone who asks. My car still has it’s issues but I am now one step closer to getting the car where I want it to be thanks to Google and a little elbow grease. I’ve always had a problem with the steering wheel making my hands smell and feel oily after driving the car, especially when the weather is warmer. 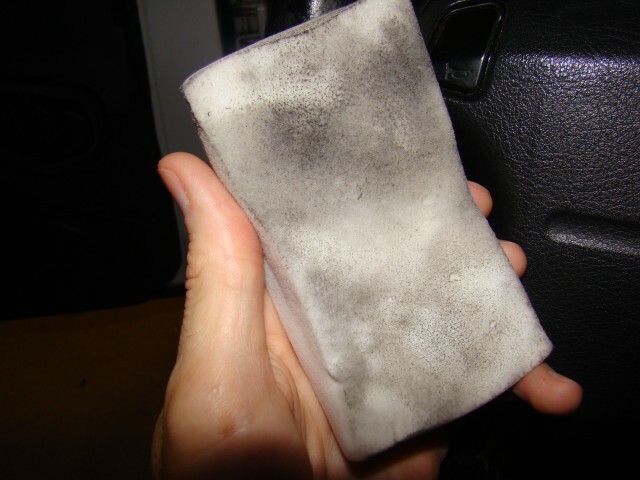 I am pretty sure this comes from one of the previous owners having used a cheap steering wheel cover and the rubber had a strong gasoline-like smell to it that soaked into the leather. I’ve tried to clean it with numerous cleaners but haven’t had any luck. 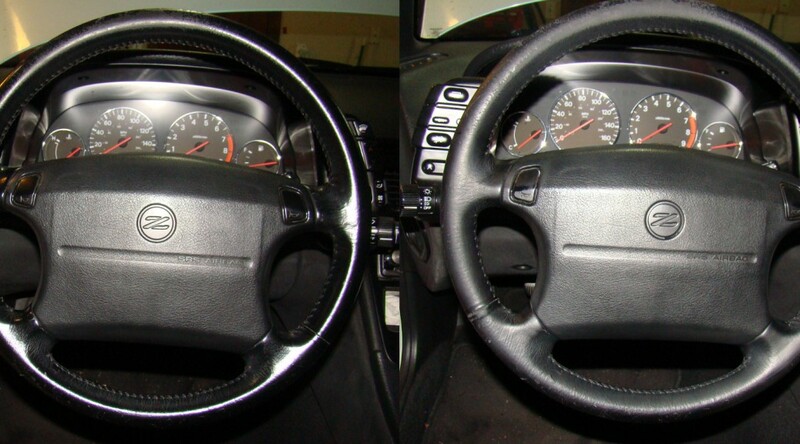 I followed the simple cleaning method listed in the article above and used a Magic Eraser with water to clean the leather steering wheel. I’m not sure if it will ultimately get rid of the smell but it certainly worked great to clean up the wheel and get a lot of funk off of it. 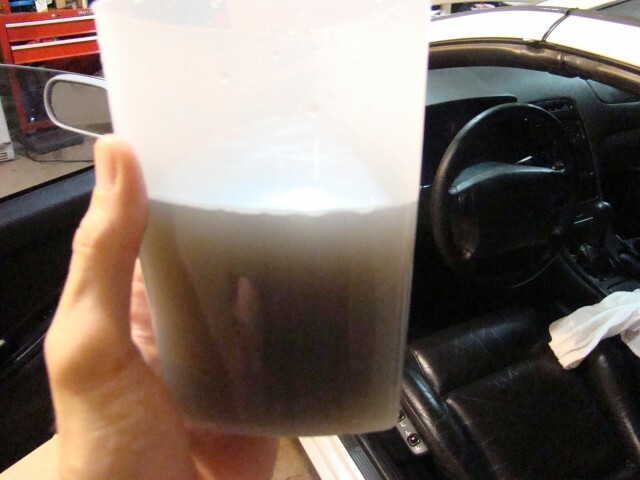 Here are some pictures of the before/after and how dirty the water was. I’m not sure if any of that is leather dye that comes off but I plan to have the steering wheel re-done at some point so I’m not too concerned about that. If you are going to try this and you are worried about the dye coming off I wouldn’t scrub too hard.